I totally forgot about this model! I really should have included it in my tank renovation project but it would also have worked in my rebasing project. 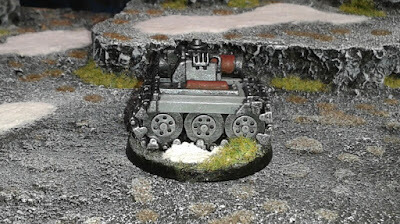 I built it out of a few spare tank parts to represent a "Cities of Death" Imperial Guard strategic asset which is basically a bomb on wheels. Work hasn't been progressing as quickly as I'd like on this project but I'm still making progress which can only be positive, I guess. I've added the same engine glow as I've used on my other Tau models, but haven't gone back over the edges of the vents yet with black - I'll get to that when I detail the models. 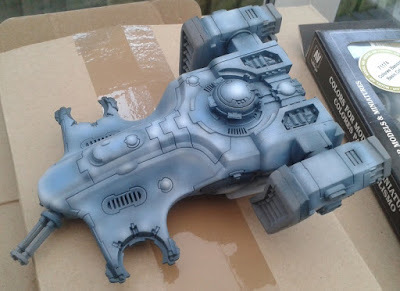 My intention next is to get the hulls of the other tanks up to the same stage as this one and then apply the grey highlights to them all to get them to the same stage as the engine pods. 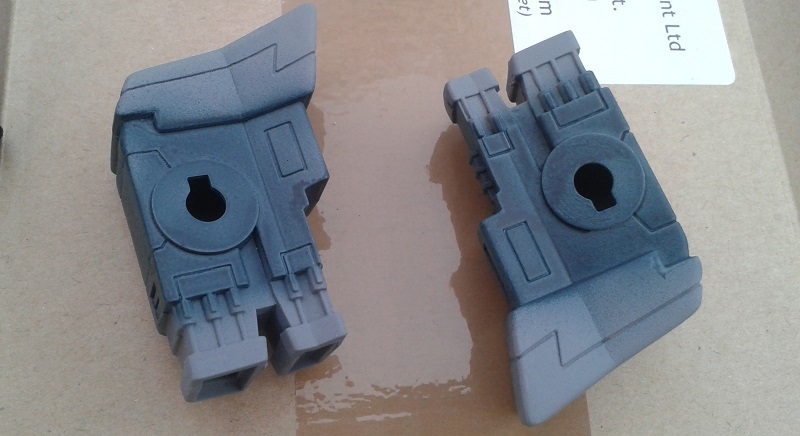 I've got a few errors to correct too (bits of overspray here and there). After that I need to turn my attention to a bag of bits I haven't looked at yet - turrets, hatches, railguns and suchlike). I've not managed to get as much done as I'd have liked over the last few days. Real life got in the way. 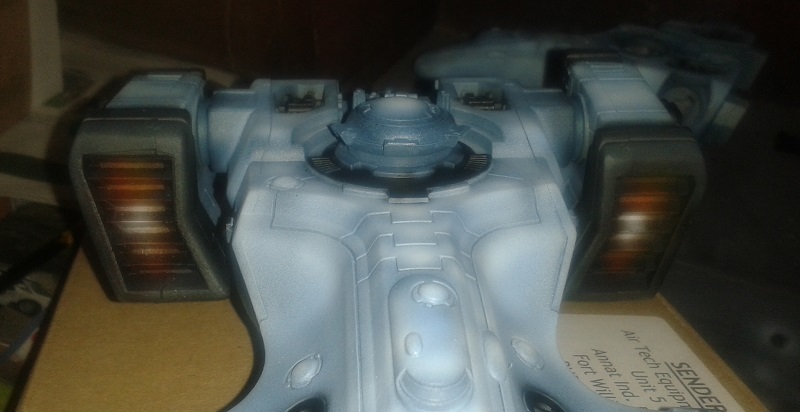 What I have managed is to black-up all the parts I want to blacken on one of my tanks just so I can make sure it's working as an overall scheme. 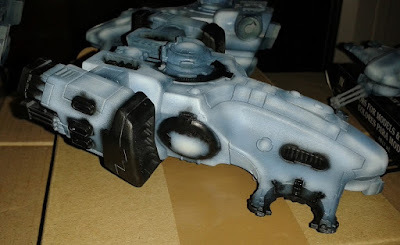 I've used the same scheme on my other Tau models so I'm not in much doubt, but there is a lot more to blacken on the tanks than the other models so the balance of dark-to-light is skewed by comparison. I think it's still working though. 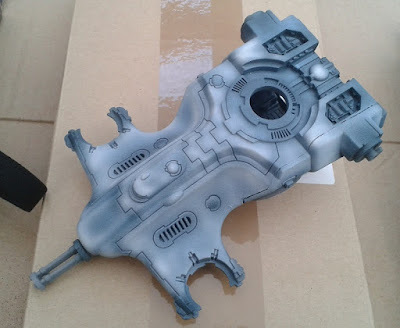 Well, it's been a long break but I figure it's time to get back to work on my Tau. 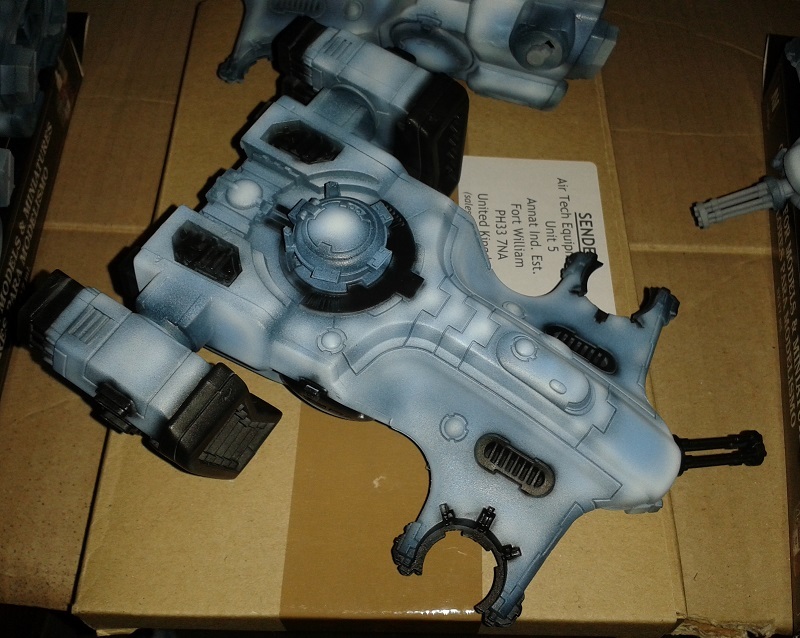 I still have a fair amount of work to do to finish this army (Stealth suits, Battlesuits, Drones, Aun'va, O'Shova, not to mention a shedload of alien auxiliaries) but I decided I'd start by getting some paint on my tanks. 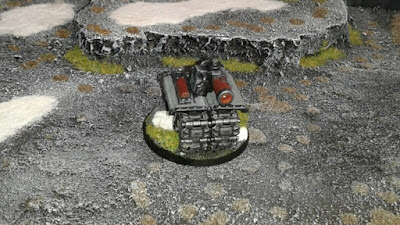 I covered magnetising the tanks in some previous posts (here, here and here), so this is just about painting. Next I add some Minitaire "Snow White" again to pick up highlights and lighten the colour of the model overall. Here's the model with the engine pods in place. 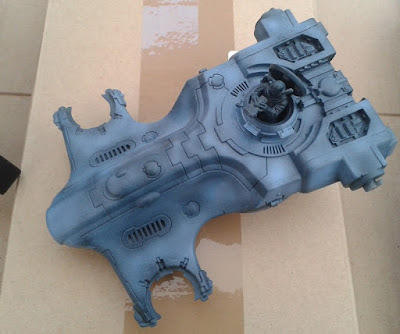 Next I'll start picking out all the dark bits of the model. I'll be doing that again with the airbrush (my intention is that 90%+ of the paint on all the models in this army should be applied using the airbrush). So, here it is. 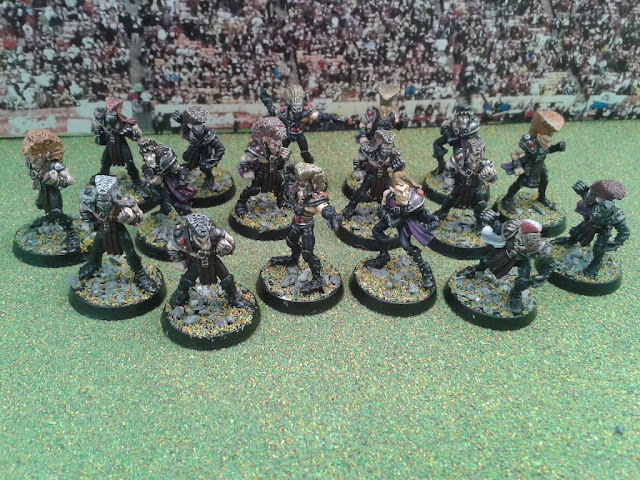 The whole of my Wood Elf Blood Bowl team in its finished state. I don't know what it is about BB teams but I always find they take longer to paint than other models. 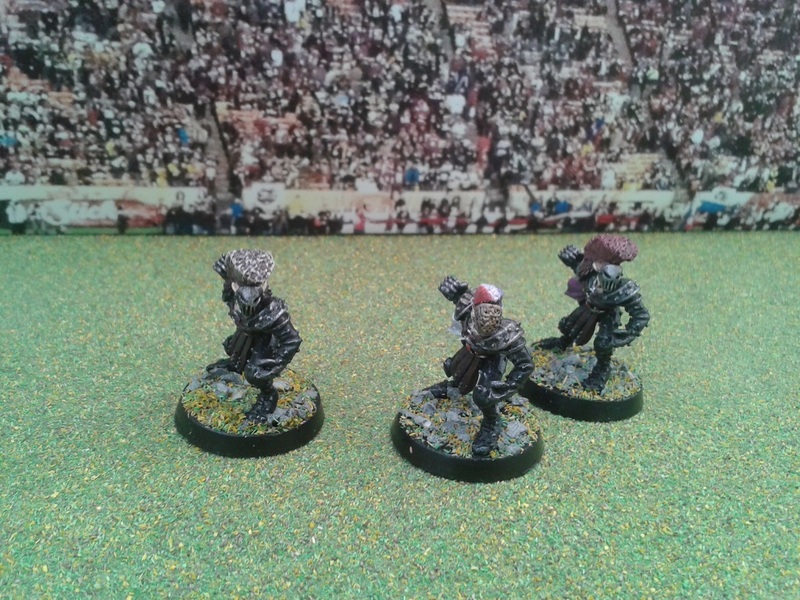 I find that a little off-putting which is why I still have four unpainted teams. Still, they do make for a nice distraction task in between bigger projects so that's probably what I'll use them for. If I recall correctly, Wood Elf teams can only field two Wardancers so I painted the middle one slightly differently (striped hair and a white sash - purple being the norm for the team) and I plan to use him as a Star Player.